Written by Paul Curtis on March 21st, 2018 May 10th, 2018 . One of the things that irritates me a lot is manual work that should be automated by machines. Automation always trumps the error-prone human and, in my case, offered the opportunity to get to use some of SEGGER”s software I’d never used before to develop a useful tool. What I wanted to do was automate gathering of on-target benchmark and selftest results for emCrypt, our extensive cryptography library. Customers are always asking how big things are, how much RAM they use, and how fast they run. I had always run the on-target emCrypt selftests and benchmarks by manually loading them onto hardware, running the code in Embedded Studio using RTT to output the results, and then copy-pasting the results into the emCrypt manual. And repeating the whole process for the next benchmark or selftest. I built the solution from existing and new parts bound together in a small batch file. Managing your project with configurations to select compilation options, preprocessor defines, and application-dependent features makes development so much more productive. You can change configuration to an instrumented debug build in an instant when faced with a problem, or into a minimum size release build when unexpectedly requested for some metrics: click the dropdown, select the appropriate configuration, build and run. This is much simpler than editing your configuration settings in the plain Debug and Release configurations because it’s almost inevitable that a quick-and-dirty setting change in one of those configurations gets forgotten. 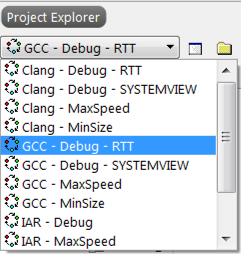 Using Embedded Studio’s configuration inheritance capability can really streamline your development process! Continuing on, I modified the script so I could easily choose the target processor and application I wanted to build as the existing script indiscriminantly created all projects for every board and every application it supported. And I chose to use the “Clang – MaxSpeed” configuration for benchmarking, but could equally have chosen some other configuration. With the project created, time to build. Embedded Studio ships with a command-line application, emBuild, that loads a solution file and builds a particular project in one or more configurations: just what I need! No coding necessary, just a few lines of batch script to get the correct spell when building. So this is where I ran into trouble. SEGGER has a set of utilities to program targets (e.g. J-Flash) and capture RTT (RTT Client and RTT Logger), but they are not easily automated and they are GUI-based rather than being command-line oriented, which I needed for my script. After canvassing the J-Link and Embedded Studio teams, we came to realize that no single utility would do what I needed and no utility is easily modified to do what I want. So, what does an engineer do when presented with such a conundrum? Simple: turn it into a programming task! It seems obvious that SEGGER has everything I need from a quick inspection of our products: Ozone and Embedded Studio can both read ELF files, program targets, and capture RTT output. The best option for J-Run was to take what we already have as proven components and do what a customer would do: write a utility that exactly fits the intended purpose. J-Link SDK which can program and debug a target. I used only the SEGGER documentation and distributed libraries. That is, I didn’t use any internal knowledge and I didn’t contact the teams for assistance when writing J-Run. ELFLib gets me everything I need to program an ELF file into the target: I can find section and program information and I can look up symbols. The J-Link SDK gets me everything I need to program the target and interact with a running program. It’s all very straightforward, a few hours of work to make the application look nice and add command line options for full flexibility. In the end, the application is about 400 lines of code, with headers and comments, so is far from complex. As an executable it’s only 53K. Purpose     : Show how J-Run can capture benchmark or unit test output. *   running the main application. Anybody can easily write a custom application for J-Link using SEGGER components such as ELFLib and the J-Link SDK. What’s more, because these are documented and tested components, you can be confident that your custom application will be both reliable and efficient. Purpose     : Load, run, and capture application output through J-Link. *    sFormat - Optional error message format string. *    sFormat - Log message format string. *    Match string against wildcard. *    sPat - Wildcard pattern to match against. *    sStr - String to match against wildcard. *    == 0 - No match. *    != 0 - Match. *    argc - Argument count. *    argv - Argument vector. // Find the RTT control block. // Set device, interface, speed. // Program device from ELF file. // Dump terminal data until termination wildcard matched.